Ultimate Water, Inc., an Arizona company that invents, manufacturers and distributes various products that "structure water" is seeking competitive bids from potential exclusive licensees, distributors and marketing affiliates. The company has just published a 141 page Introduction to the Health Benefits, Cost Savings and Environmental Advantages of Structured Water Ebook that is available on a donation basis to subscribers to the company's free ezine. 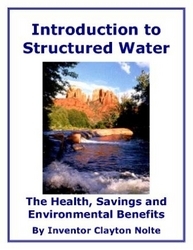 This 141 Page E-book Introduction to Structured Water E-book is available for free. Ultimate Water, Inc., an Arizona company that invents, manufactures, and distributes various products that structure water is seeking competitive bids from potential exclusive licensees, distributors, and marketing affiliates. Clayton Nolte, inventor and founder of the company, has just published an informational digital book about water structuring. He is offering copies of the Ebook on a donation basis to subscribers of the company's free online magazine at http://www.structuredwater.info. The Company was incorporated by inventor Clayton Nolte, who worked for forty years in the military and as a consultant in the field of Research and Development. Through his ongoing research of the science of structured water, Nolte has developed innovative technologies and has invented and fabricated several devices that prove the science. "In my forty years working with water technology, I have never experienced anything which equals the ultimate breakthrough of these structured water devices. Whether one is an environmentalist, grower, poultry or dairy farmer or seeking optimum health, there is no equal available on the market today." Charles Hinkley, Ph.D. The initial structured water products manufactured and being marketed by the Company include: the structured water shower units, kitchen sink units, whole house units, and garden landscape units. Commercial units are also available for greenhouses, dairy and livestock operations. These products have already been sold and are being successfully used in the United States as well as several other countries, including Canada, Mexico, Australia, India, Greece, Venezuela, Peru, Uruguay, Germany, Argentina, Bulgaria, Czechoslovakia, Costa Rica, etc. Here are just a few of the hundreds of structured water success stories from all over the world. Many more are available at http://www.ultimatestructuredwater.info/testimonials.htm. Jackie C. of Save Your Dairy, where they water their cows with "structured" water, discovers structured water affects bio-photons and eliminates staph bacteria from raw milk. Roger Dagget, a greenhouse operator in Coolidge AZ, experiences a 500 to 1,200 percent increase in the nutritional value of food grown with structured water. A greenhouse grower of strawberries in Ohio lost 75 percent of his plants in a storm. He grew the remaining 25 percent in structured water and produced more berries than ever before, bringing his crop to market three weeks ahead of his competition and continuing harvesting 3 weeks longer than the other growers. The local Farmers Home Office said, "This is impossible!" when they tested the quality of the strawberries. Jacquelyn Aldana of Los Gatos, CA had invested more than $31,600 in water enhancement systems and still didn’t have drinkable water. A water structuring device that cost less than $1,000 provided superior quality, life-enhancing, "living water" from every water source inside and outside the home, guest cottage, studio, stables, and every outbuilding on all three acres within 300 feet of the installation. Vicki Frank of Ft. Wayne, IN and her family moved into a dream home, then found that the water represented a health nightmare. Years of research and tens of thousands of dollars failed to remedy the problem until she installed a structured water device. Ultimate Destiny Network, Inc. is seeking applications for non-exclusive distributors, sales representatives, and affiliates. Any individual or company interested in those income opportunities may contact Charles Betterton by phone at 928-284-5566, by mail at Ultimate Destiny PO Box 20072, Sedona, AZ 86341 or by email.